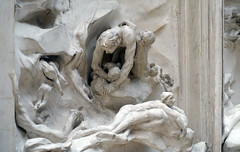 When the building that stood on what is now the site of the Musée d’Orsay in Paris was destroyed by fire during the Commune in 1871, plans were drawn up to replace it with a museum of decorative arts. 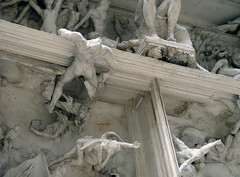 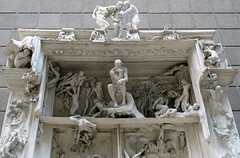 Rodin won the competition to design a great set of doors for its entryway. 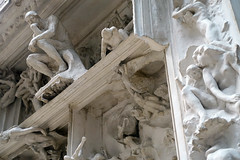 Although the museum was never built, Rodin continued to work on the doors. 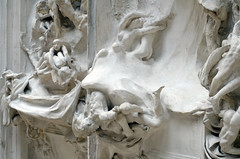 They became an ongoing project; a grand stage for his sculptural ideas. 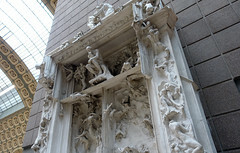 It’s fitting that the plaster of this great unfinished sculpture, The Gates of Hell, is now on display at the d’Orsay, the former railway terminal that was built on this site instead of the museum of decorative arts and that, by lovely coincidence, was converted into one of the world’s great art museums. 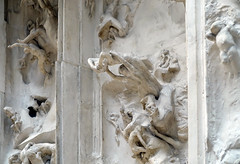 Cite this page as: Dr. Beth Harris and Dr. Steven Zucker, "A-Level: Auguste Rodin, The Gates of Hell," in Smarthistory, July 25, 2017, accessed April 20, 2019, https://smarthistory.org/auguste-rodin-the-gates-of-hell-2/.